For the first time in nearly a year of covering the Mid-South TV shows, Boyd Pierce opened this huge edition of the program alone and ran down the card. 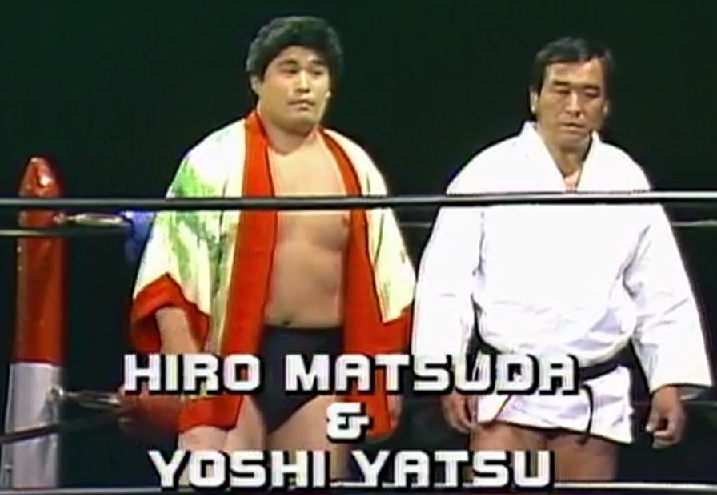 Good ol’ Boyd hyped the big No DQ, Loser Leaves Town Tag title match and listed some new stars that would be in action today, including Tony Atlas, Hiro Matsuda & Yoshiaki Yatsu. Boyd also noted that the 1982 Louisiana State Fair had begun and he talked about the “erstwhile” promoter from Houston Paul Boesch being in town for the festivities. 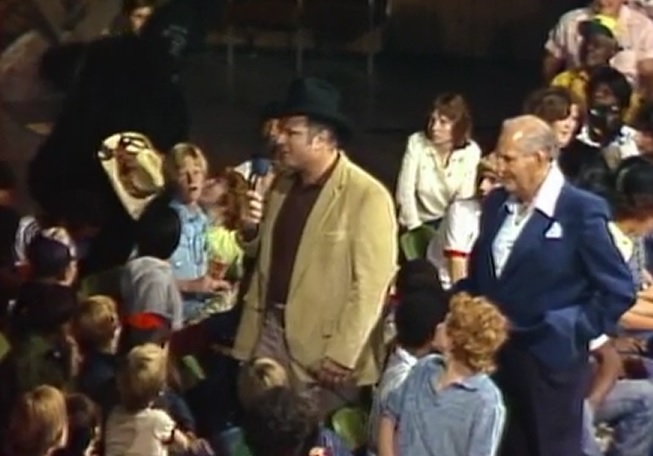 Boyd said Boesch was a “top civic leader and a humanitarian” who loved wrestling and who “loved youth.” Boyd threw to Bill Watts & Paul Boesch who were in amongst a bunch of kids in the crowd. Watts introduced the young boys who had traveled up from Texas, apparently there was a strict no girls allowed policy, and the Cowboy also pointed out that the Gorilla from the State Fair had come in to invite all the children to the, “Gorilla show” afterwards. The unassuming man in the Gorilla costume gave a friendly wave to the youngsters then took a seat and placed a cowboy hat on top of his Gorilla mask. Watts asked Boesch about the big Tag title match and hyped up the loser leaves town stipulation again. Boesch said he was particularly interested in the match because it would effect his promotion in Houston and he noted that he was pulling for JYD. Watts & Boesch talked about JYD being crowd the King of Wrestling in Houston for a while. Watts announced that Ted DiBiase called Grizzly Smith earlier in the day and told him that Hacksaw Duggan had been “incarcerated.” Watts noted that this was totally believable because Duggan was a madman and announced that Matt Bourne would replace Duggan as DiBiase’s partner and the match would go on as advertised. To wrap up, Watts threw to footage of a big six-man tag match from the Sam Houston Coliseum. Andre the Giant, JYD & Mil Mascaras vs. Killer Khan, Tully Blanchard & Gino Hernandez. – Andre, JYD & Mascaras over in 2:50 TV Time (JIP). Match took place on 1/10/82 in Houston and Watts re-dubbed the commentary to accommodate the Mid-South viewers. Khan got the heat on Andre by going after the ankle he broke in storyline in the WWF over a year ago in 1981 – as noted in previous reviews, Andre actually broke his own ankle getting out of bed and they shot the angle with Khan to get him over as a monster heel. Mascaras ran wild off the tag and came off the top with a high cross on Tully – Watts noted that it was legal to come off the top rope in Houston and said Paul Boesch would be meeting with Mid-South President Charlie Lay to possibly “consolidate” the rules. Finish saw it break down with all six guys brawling. Tully went to throw Mascaras over the top, however Andre caught Mil and threw him back over the top rope onto Tully to get the pin. – Everyone looked good here from the short clip that was shown, but Mascaras really stood out as the star performer. Back with Boyd & Watts at the desk; Watts put over Mascaras and hyped his appearance on the next big Superdome show on Thanksgiving night. Watts then threw to the ring for the first match, and this is a direct quote, for, “Ted…(Watts is stricken with panic and looks from side to side while he struggles to remember the correct surname)…and Kamala the Giant.” The look on Watts‘ face when he drew a blank on Ted Allen’s surname was hilarious, however it was surpassed moments later after Watts finally finished his sentence and he looked like a man who knew he had just made a complete moron of himself on regional television. Boyd Pierce also had a priceless look on his face while Watts dying in front of the camera, however he kept his mouth shut and acted like a pro. Kamala w/Friday vs. Ted Allen. – Kamala over in 0:50. Watts apologised for his gaff and blamed it on the fact that he had been with Grizzly Smith all day trying to find out what was going on with Duggan & Matt Bourne. Usual Kamala squash; he killed Allen and gave him absolutely nothing in return. Kamala won with a Big Splash and that was that. No DQ, Loser of the Fall Must Leave for 90 Days Match for the Mid-South Tag Team Championship: JYD & Mr Olympia (C) vs. Ted DiBiase (North American Heavyweight Champion) & Matt Bourne. 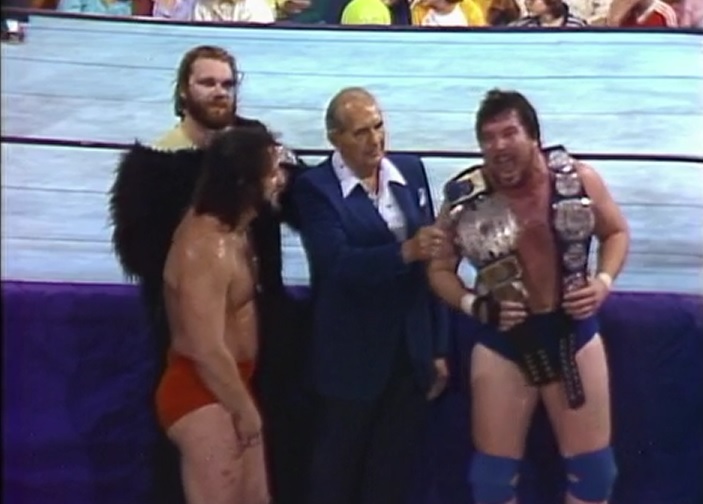 – DiBiase & Bourne captured the Mid-South Tag Team titles in 12:02 TV Time, JYD must leave Mid-South for 90 days. Match started out hot and the babyface champs cleared the ring. JYD & Olympia shone early and made it clear they were the superior team in a fair contest. Watts brought up that the Gorilla from the State Fair was in attendance and they showed a shot of the great ape enjoying the action. DiBiase & Bourne continued to sell their asses off until DiBiase countered a chinlock from Olympia into a big Belly-to-Back suplex. Heels got the heat on Olympia and worked over his back. The big spot saw Bourne come off the top with the Bombs Away on Olympia and Watts went crazy about the move being illegal under normal circumstances. DiBiase followed up with a Powerslam, but JYD broke up the pin and dragged Olympia over to their corner to make the tag. JYD ran wild and the crowd went insane – there were literally people jumping up and down with excitement. DiBiase tried to load up his black glove of doom but JYD fought to get hold of the gimmick and nailed Bourne as he came off the top again. The finish is one of the most famous in Mid-South history, as DiBiase spilled to the outside and the Gorilla appeared at ringside to deliver a big slam to Olympia on the floor. The Gorilla’s mask came off and Watts yelled, “THAT’s DOOGAN!” like a crazy man. Duggan got in the ring and nailed JYD with his flying NFL headbutt then DiBiase loaded up his glove and KO’d the Dog to score the pin. The heels celebrated with the Tag titles and Watts solemnly noted that the Junkyard Dog had to leave Mid-South for 90 days. – This is one of the most well-known, much romanticised angles and matches from Mid-South and it is easy to see why it has gained almost legendary status over the years. The set up at the start of the show was tremendous and the payoff was executed so well that it worked like a charm. Sure Duggan masquerading in a Gorilla suit may seem a little hokey through modern eyes and even in 1982 it was probably a little too wacky for Bill Watts‘ booking practices. However, what wasn’t hokey or silly in anyway were the consequences of the heel’s evil plan that meant JYD was banned for 90 days. Of course, things did in fact get a little goofy with the whole Stagger Lee deal, but for now at least it looked like DiBiase and his goons had finally got rid of the Dog. “Mr USA” Tony Atlas vs. The Grappler #2. – Atlas over in 2:44. Watts said he had lost his voice during the last match and noted that he had also lost his heart. After halfheartedly putting over Atlas, Watts told Boyd he would have to do the rest of the show without him and said Paul Boesch would take his place because the old Cowboy had to go see how JYD was doing. Atlas did some basic athletic babyface stuff, headscissors and monkey flips etc. Finish saw Atlas win with a Military Press Slam and a Big Splash. – Nice debut for Atlas, but the crowd weren’t really into the match after what happened with JYD. Gino Hernandez vs. Jesse Barr. – Hernandez over in 3:01. Paul Boesch joined Boyd Pierce on commentary and he talked about Gino working for him in Houston. Gino played the cocky heel really well and sold a little for Barr after getting a little to overconfident. Finish saw Gino win with his wacky reverse diving elbow drop off the second rope. – Another solid debut here and Gino looked infinitely more polished than Atlas did before him. After the break, Paul Boesch was at ringside with DiBiase, Bourne & Duggan, who was still in the Gorilla costume, minus the head; Boesch said Bill Watts couldn’t contain himself, so he was conducting the interview instead. DiBiase noted that he took the North American title away from JYD in a No DQ match and he just did the same with the Tag Team belts. Duggan said he sacrificed himself to take out JYD and pointed out that they had all the belts, expect one, in the territory. DiBiase said he would put food on his table no matter what then declared the trio as the new kings of wrestling. At the desk, an indignant Boyd Pierce said everybody saw what happened to JYD and Boyd stated, “I don’t like it one bit.” – DiBiase carried this segment and unsurprisingly cut a fantastic heel promo. Mr Wrestling II vs. Marty Lunde. – Wrestling II over in 3:28. Boesch again talked about the fans being subdued after the Tag title match. Match was very basic; Two hit his Knee Lift a couple of times then landed a Body Slam. Finish saw Two deliver a big running Knee Lift to get the pin. Hiro Matsuda & Yoshiaki Yatsu vs, Vinnie Romeo & Tim Horner. – Matsuda & Yatsu over in 2:08. Matsuda schooled Horner with some grappling then he and Yatsu made frequent tags while they worked over Horner’s leg. Romeo hit Matsuda with a Dropkick, but Yatsu cut him off with a beautiful over-head Belly-to-Belly Suplex to get the pin. – This felt very rushed, but Matsuda & Yatsu looked like world-beaters here. Wrap-up with Boyd & Boesch at the desk. Boyd hyped Buck Robley & Mr Wrestling II vs. The Grapplers and Gino Hernandez vs. Tony Atlas for next week, plus he noted that they hope to speak with Ted DiBiase again about what went down with JYD. We’ve had a few “must watch” episodes of Mid-South during our run of covering the shows: The Bob Roop/Paul Orndorff angle where Roop tampered with Orndorff’s starter-motor so he could take his place in a North American title match with JYD. The infamous Ted DiBiase vs. JYD North American title match where DiBiase turned heel and used his loaded black glove to win the North American title from the Junkyard Dog. These are just a couple of episodes that come to mind when recalling some of the best angles of 1982 and this show with Duggan in the Gorilla costume and the formation of the Rat Pack is right up there with anything Bill Watts & Ernie Ladd came up with all year long. The rest of the show was nothing special, although Matsuda & Yatsu killing some jobbers was fun, but do yourselves a favour and check out the opening of the show and the Tag title main event to see how to set up and execute a swerve that actually made sense. I’m sure most of you will have come across the angle at some time or another, but if for what ever reason you haven’t, or you just want to check it out again, it is featured on the WWE best of Mid-South DVD and the entire episode is up on the WWE Network. Either way, everybody needs to see Bill Watts, one of the greatest promos of all-time, forgetting Ted Allen’s name and dying a slow death in front of the camera.